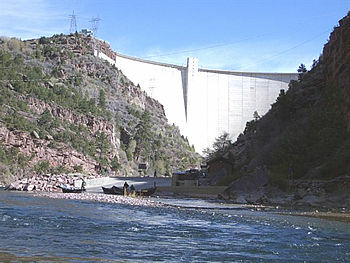 This is the 7th time I have fished the Green River below Flaming Gorge in Utah. I fished it once in August and it rained - no, it poured - everyday. It never got too cold, but to see pictures of our group, you would have assumed that we were on a winter camping trip and trekking through snowbanks. I have been back in January, February, March and April and prefer to fish the Green in late winter, early spring. This is the peak fly fishing time on the Green and you have to make your motel and guide reservations early. And, if you want to walk the 7.5 miles of the "A" Section, then bring your own rock to stand on as it can get crowded on shore. The early spring weather is volatile. You hope for rain, sleet or snow as that brings off the green drake hatch. You fish with size 22 or 24 tiny little flies and watch for rising fish. If the weather is too bad, you can't see the flies for the disturbed water, but you can feel when the fish takes. At this time of year, the fish are also looking for early cicadas and are happy to hit those as well. If the weather is calm, then you nymph with indicators. The Green is a great place to fish in our off-season and is a place where you know you will see lots of beautiful fish. The Green has two varieties of browns, four of rainbows, and cutthroat and cutbows. Then there are a few whitefish and squaw fish as well. The fish are all big, healthy and strong. If the weather is calm and there isn't too much run off from recent rain, you can also fish the "B" section but those days are infrequent. Mostly you hope for bad weather and good fishing on the "A" section. This year, we fished with snow, sleet, and rain and the temperatures never got above 38. You just come prepared and have a great time. 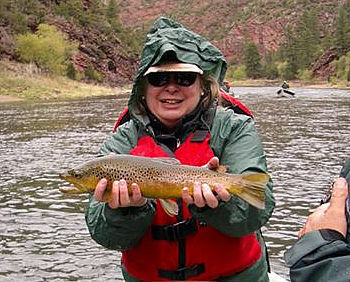 Denny Breer owns Trout Creek Flies which provides most of the guides on the Green River. Apparently, I am the only woman who organizes trips with Denny. Since I have mostly taken women, with sometimes one man on the trip, we have become known as the "Ladies From California". And, we always catch a lot of fish. Many, many fish. 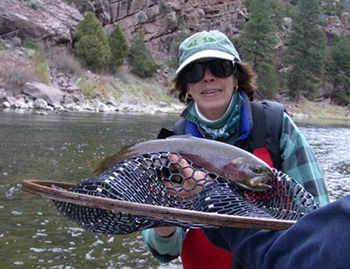 We book with excellent guides and have been fortunate to have great success fishing. I didn't take this too seriously until last year when our boat made a stop at the composting outhouse. As I was climbing the hill, two men were pointing at me, talking and waited for me to get to the top. When I approached, one of them asked if I was one of the "Ladies From California". I confirmed that I was and they commented on how many fish we were catching. I modestly confirmed that we had caught a few. This year, George Puthoff, Richard Holubek and Elizabeth (Beth) Sheppard joined me for 3 days of fishing from drift boats with guides. George is from San Diego and we are semi-not-related. My daughter, Laure, has been on three previous trips with me and couldn't go this year as she just had a baby. My younger daughter, Melinda, has never been fly fishing and was supposed to go with me - or at least I was planning on it, but she just got promoted at work and couldn't take the time off. She emailed my memo (more about the memo later) to her boyfriend, Sasha's best friend Trevor who is also dating her roommate, Tiffany. Trevor emailed it to his father, George. George emailed me and asked if he could come of the trip with his friend, Rob, from Seattle. I invited both of them, tickets were purchased and reservations were made. During this time, Richard Holubek asked if he could join us. So, this year's Ladies From California were, George, Rich, Rob and me. Then Rob had to cancel at the last minute due to a family conflict and Beth was able to join us. Beth is a new member to PFF and was a welcome addition to the group. Beth and I hung out at the Salt Lake City airport asking men traveling alone if they were George and if they wanted to go fly fishing. Finally, one of them said yes so we took him with us. Richard drove, stopping along the way to visit with his daughter and brother, and picked us up and we were on our way. We took 80 up through Wyoming stopping briefly at Fort Bridger as it was closed. 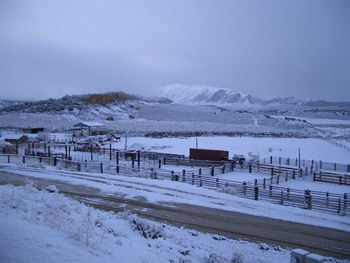 We stayed at Spring Creek Ranch again this year because they treat us so well and it's fun to get up in the morning and see the horses playing in the corrals with fresh snow on the ground. It's a cattle ranch and they also have a few llamas, goats, guinea hens, cats, dogs, etc. The Ranch also has resident herds of pronghorn antelope, elk and deer. So, you don't know what you are going to see. The first morning we woke up to fresh snow on the ground and a beautiful view of the surrounding mountains. After a great breakfast, we headed to meet up with the guides and get legal. Our guides were Doug Burton and Darren Bowcutt. They are the key to the enormous number of fish we catch. Doug is also the first guide that I ever went out with and takes justifiable credit for improving my technique over the years. He also has the prettiest boat on the River. Darren is a very competitive guide, and you will catch large amounts of fish in his company. A couple of years ago, Terry and Sue Hall were going on the trip. Terry was a little concerned that as Fish Master (I do this for the job title), I wasn't taking my duties very seriously. So I sent him "the memo" that included everything he needed to know about the trip. It has come in handy as I just change the dates and use it every year. The memo is 4 pages long. You all know Richard. He just has to make comments, and the memo gave him a lot of fodder. Debbie told him that at least he now knew everything he would ever have a question about. George and I fished the first day with Doug. For the Green, it was a quiet day and George is one of those very quiet, but expert, fishermen who just keeps hauling in fish with very little fuss, as he's been doing most of his life. The following day, Beth and I fished with Doug. Beth caught several fish, including the monster pictured. In the afternoon, we were stopped while Doug was re-rigging us. While he was working on Beth's flies, I had tossed my flies over the side and was bobbing the indicator (bright yellow yarn) up and down. A 20" cut throat came swimming by and headed for the indicator. He swam around a little bit watching it bob up and down and then took it under. Doug told me to set and I pointed out that the indicator didn't have a hook. First, Doug's not even blonde and second, guides hate when you question them about setting the hook. He told me that if I set the hook I would "floss him". Finally, tentatively, I set the hook and caught the fish! Of course, I lost him when he jumped as I hadn't set it very well. Doug patiently explained that the fish can't spit out the indicator very easily because the twisty yarn gets caught in their teeth. When I set the hook, I pulled the line through the fish's mouth (flossing his teeth) and the hook of the top fly set. This would have been a better part of the story if I had caught the fish and had a picture to show you. Richard said that he and George had a major fish day with Darren. Of course I totally believe Richard, but I trust George, and he confirmed it. 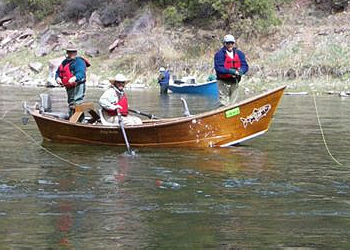 The plan was that everyone would have an opportunity to fish with each guide and each other. This worked well until the last day when Richard decided that he didn't want to fish with me but would prefer to fish with George for a second day. What can I say? Richard and George fished with Doug, and Richard got sea sick. I didn't have anything to do with it. I swear. There is a nice little back eddy by a large pond area on the A Section that used to have a very large resident pet fish. He's gone to that big river in the sky and a lot of medium fish have moved into his territory. Darren had me casting 70' into the wind with tiny double dries. Thank goodness for my Sage 6 weight. I was actually able to precision place the flies multiple times without braiding line, loosing flies, hooking the boat, Beth or Darren. Within 15 minutes, I had six fish in the boat and had four more that I lost before they were landed. I was screaming. A guy was fishing a little down river on the other side, and I was so loud that I knew he was going to pack up and move. He did by moving closer to me (and the fish). We drove to Vernal that night. 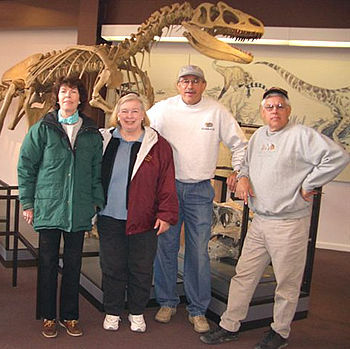 Vernal has a little Natural History Museum that is a gem. A new facility is being built across the street so we only got to visit the small park with replicas of dinosaurs. The gang with a former resident in the background. Then we headed east to the Dinosaur Quarry in the Dinosuar National Monument Park. This is thrilling and, in winter, has the added advantage of very few visitors. We enjoyed our visit and headed off for the airport where Richard dropped us off and continued his trip with more fishing on the way home.